Tropical treasures await you when you start playing Tiki Wonders, a very enjoyable 5-reel, 30-line video slot brought to you by Net Entertainment. Welcome to this tropical paradise where you can listen to Hawaiian music and enjoy the beautiful hula girls, dolphins, turtles, Tukan birds and of course some delicious cocktails - you will surely enjoy your stay! When at least 3 Hula Girls start their little dance, you will receive 10 free spins and your total bet will be quadrupled. 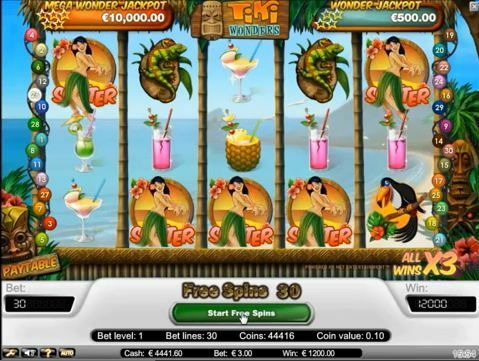 4 Hula Girl Scatters pay out 50 times your bet, and you will have 20 free spins to play. You've definitely arrived in paradise when 5 Hula Girls show up on any line, bringing you 30 free spins and 500 times your bet! Your winnings during free play are tripled, and the free spins feature can also be re-triggered! It's good news when the Hawaiian Voodoo Man makes his entrance in this lovely paradise, because this is the wild symbol, which substitutes all symbols, except for the Hula Girl and the jackpots. Get 5 Hawaiian Voodoo Men, and you will win no less than 10,000 credits! That's not all though, you can also win 2 Jackpots: the Wonder Jackpot of €4,500 when you hit 4 symbols with a yellow star and the Mega Wonder Jackpot - which currently stands at almost €64,000 - when you hit 5 symbols with a yellow star! 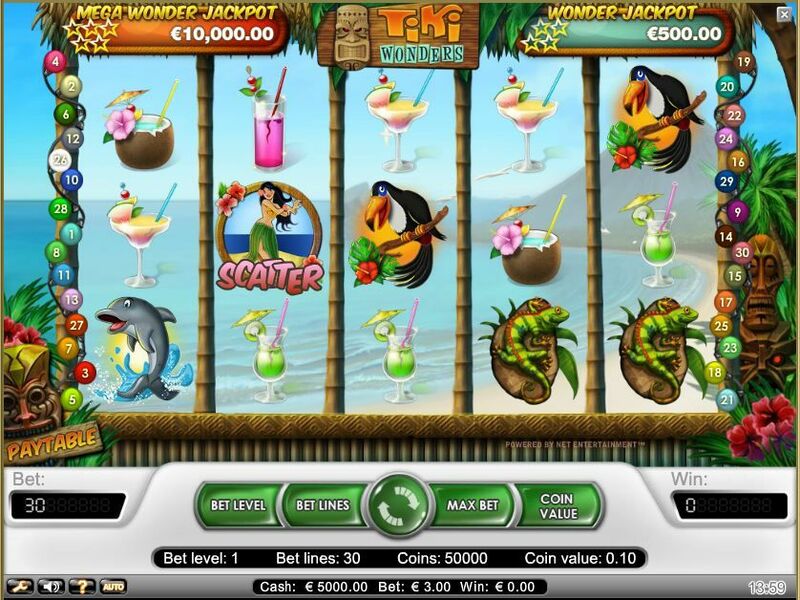 You can start playing Tiki Wonders with a minimum bet of € 0.30. And there are 4 bet levels and 6 coin values to choose from - if you feel lucky you can play a maximum of € 60.00 per spin! I find this a very rewarding video slot, so you may want to start off at the 2nd bet level with a total bet of € 0.60, € 1.20, € 3.00, € 6,00, € 12.00 or € 30.00, depending on the coin value of your choice. All lines pay from left to right, except for the Hula Girl Scatters, which pay on any line - and you can also use the auto play feature, which you'll find on your left hand side.